I'm about a third of the way through the Pulitzer novels (most of which I've written about here, though a few I'd read several years ago). And far and away my favorite remains Rabbit is Rich, followed closely by Rabbit At Rest. I've just not encountered anything as darkly funny, as rich in character, or as artistically taut as Updike. A sad fact, of course, about adult life is that you see the very things you'll never adapt to coming toward you on the horizon. You see them as the problems they are, you worry like hell about them, you make provisions, take precautions, fashion adjustments; you tell yourself you have to change your way of doing things. Only you don't. You can't. Somehow it's already too late. And maybe it's even worse than that: maybe the thing you see coming from far away is not the real thing, the thing that scares you, but its aftermath. And what you've feared will happen has already taken place. This is similar in spirit to the realization that all new great advances of medical science will have no benefit for us at all, though we cheer them on, hope a vaccine might be ready in time, think things could get better. Only it's too late there too. And in that very way our life gets over before we know it. We miss it. And like the poet said: "The way we miss our lives are life. For some reason she puts her palm flat on top of her bobbed red hair and blinks, as though she were holding something down inside her skull. Every age of life has its own little pennant to fly. Karl gives the Times a good snapping as though to get the words lined up straighter. What makes (to me, anyway) Independence Day Pulitzer-caliber is how Ford takes the simple theme of independence (emotional, romantic, financial...) and makes a kind of vehicle out of it, in which the protagonist travels over the course of his holiday weekend. Each encounter he has, each experience he moves through brings him closer to understanding himself--and precisely how independent he really is (often to his surprise or disappointment). At moments Frank's self-absorption becomes tiresome, but one can never fault him for not seeking self-awareness. Today, after all, is not only the fourth, but the Fourth. And as with the stolid, unpromising, unlikable Markhams, real independence must sometimes be shoved down your throat. 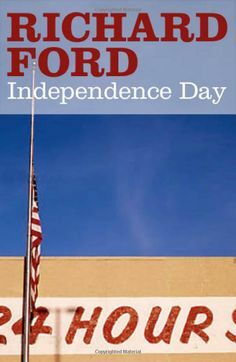 Independence Day, at least for the daylight hours, confers upon us the opportunity to act as independently as we know how.